Britain’s Prime Minister Theresa May and South African President Cyril Ramaphosa take part in the ceremony to hand over the bell of the SS Mendi, on August 28, 2018 in Cape Town. The British Prime Minister, Theresa May, has begun her three-nation African tour in South Africa where she has held a series interactive session with school children, business leaders and South Africa’s president Cyril Ramaphosa in Cape Town. “By 2022, I want the UK to be the G7’s number one investor in Africa, with Britain’s private sector companies taking the lead,” May told business leaders in Cape Town. The G7 groups’ major industrialised nations but does not include China, which has become a big investor on the African continent. Her tour of South Africa, Nigeria and Kenya — May’s first to Africa since becoming premier in 2016 — is seen as an effort to reinforce Britain’s global ambitions after Brexit. “I want to create a new partnership between the UK and our friends in Africa built around shared prosperity and shared security,” she added. May is facing pressure at home from so-called Remainers sceptical of her ability to forge trade deals once Britain severs ties with the EU, as well as from Brexiteers fearful she will not deliver a complete break. On her journey to South Africa, May suggested to travelling British press that a no-deal Brexit would not be a disaster for Britain and played down warnings of serious consequences for the UK economy. Former foreign minister Boris Johnson, whose July departure from the cabinet brought May’s government to the brink, said in his resignation speech that May’s current Brexit policy would hamper London’s ability to strike independent trade deals. But May said Britain was well-placed and had many companies ready to invest in Africa. On Tuesday, she announced a new four-billion-pound ($5 billion/4.4 billion euro) Africa investment programme. There were no immediate details about the initiative. May added that Britain would also host an African investment summit next year, and would open new diplomatic missions across the continent. The prime minister had earlier attracted mixed reviews for her tentative dance steps as she was greeted by singing pupils during a visit to a Cape Town school. 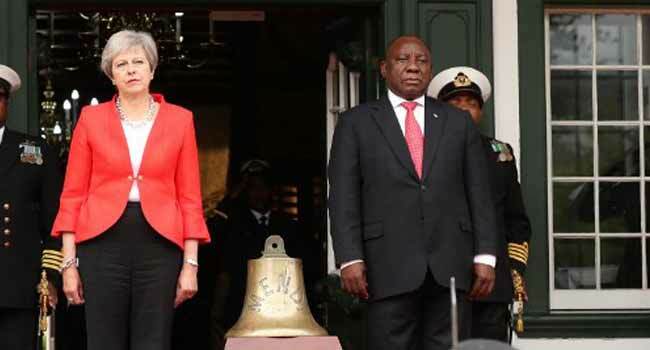 May also presented President Cyril Ramaphosa with the bell from the troopship Mendi, which sank in the Channel in 1917 drowning more than 600 mainly South African troops who were set to join the Allied forces fighting in World War I. It was the worst maritime disaster in South Africa’s history and became a symbol of its Great War sacrifice. The bell was given to a BBC reporter in 2017 following an anonymous tip. After talks with May, the president, who came to power this year, welcomed Britain’s role in his efforts to secure $100 billion of foreign investment to revive South Africa’s sluggish economy and soaring unemployment. May was expected to later visit Robben Island where former president Nelson Mandela was imprisoned for decades to commemorate the 100th anniversary of his birth. May will head to Nigeria on Wednesday for meetings with President Muhammadu Buhari in the capital Abuja and with victims of modern slavery in Lagos. On Thursday she will meet Kenyan President Uhuru Kenyatta, shortly after his return from seeing US President Donald Trump in Washington. The prime minister will also see British troops in training action and tour a business school, before concluding the trip at a state dinner hosted by Kenyatta. London and Brussels have yet to reach an agreement on the terms of Britain’s exit from the EU in March.